Senecio is a very large genus of plants, with over 1,000 species dispersed around the world. Some are lovely and others, like the groundsels and ragworts, are noxious weeds. Many, such as Dusty Miller (​Senecio cineraria), are tender perennials. This profile covers the succulents. There are about 100 succulent Senecios, including a few oddities that are not really suited to the garden, although they are certainly interesting. There are some large shrubs, but many are small, trailing plants or spreading ground covers. As with most succulents, they are very drought and heat tolerant and not very cold tolerant. There is no common name for the whole group of Senecio plants. Each species has its own common name or names. Most fall somewhere around USDA Hardiness Zones 9 to 11. A few Senecio species can tolerate brief periods of cold or dampness, but prolonged exposure will turn them to mush. Being succulents, they will grow best in full sun. Most Senecio plants are low growing, under 1 ft. (30 cm) tall. Depending on species, they may spread out or trail down about 1 ft. (20 cm). In warmer climates, you can use these plants as ground covers, rock garden plants, and specimens. Most are on the small side. These are curiosities and look best in containers, either mixed or alone. In climates with cold winters, growing them in containers will allow you to bring them indoors, as houseplants. Senecio crassissimus - "Vertical Leaf Senecio": Bluish, flattened leaves on an upright plant. An easy grower that can handle some frost. 18-24 inches (45-60 cm) H x 18 inches (45 cm) W. USDA Hardiness Zones 10 - 11. Senecio haworthii - "Cocoon Plant": Cocoon refers to the shape of the gray leaves. They form a prostrate bush but need periodic renewal. 1 ft. (30 cm) H x 3 ft. (90 cm) W. USDA Hardiness Zones 9 - 11. Senecio radicans - "String of Bananas": Puffing, crescent moon-shaped leaves punctuate long stems. More tolerant of shade and moisture than most species. 6-12 in. (15-30 cm) H x 9-12 in. (22-30 cm) W. Zones 10 - 11. 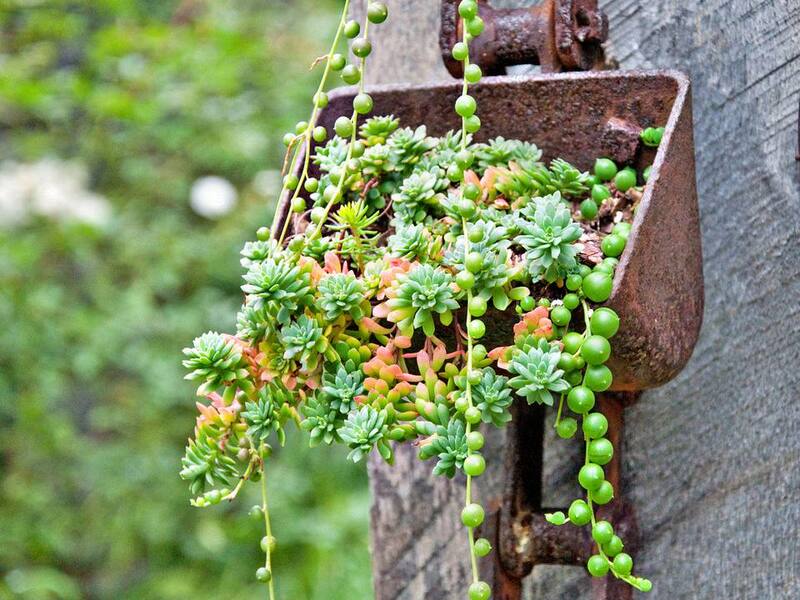 Senecio rowleyanus "String of Beads or Pearls": Dangling stems of round leaves. Thrives on neglect. A trailing plant that gets several ft. long. Zones 8 - 10. Senecio serpens - "Blue Chalk Sticks", "Blue Ice Plant": Short, steel blue, tubular leaves. (Several species go by the same common names as this plant.) 12-18 in. (30-45 cm) H x 18-24 in. (45-60 cm) W. Zones 10 - 11. Soil: Senecio planats don't seem to be particular about soil pH. Something in the neural range (6.0 - 7.0) would be fine. More importantly, make sure the soil is on the sandy side and well-draining soil. Plants will rot if left damp. Planting: Senecio plants can be grown from either seed or cuttings. Seeds require warm temperatures (55 F.) and constant moisture to germinate. Cuttings are easier and faster. Cut during the growing season, early spring to fall. Root in sandy soil, in containers. Established plants are extremely drought tolerant. They do need some water, during the summer, but do not leave the soil wet for prolonged periods. Allow the soil to dry out between waterings in the winter, when they are somewhat ​dormant. Since they are growing in sandy soil, nutrients will need to be replenished. Fertilize annually, but lightly. Too much fertilizer will cause a lot of leggy growth. Few pests bother Senecio. They can occasionally be affected by scale and mealy bugs.